CAMUS, Edmond Gustave and Aimée Antoinette CAMUS. Iconographie des orchidées d'Europe et du Bassin Méditerranéen. Paris, Paul Lechevalier (colophon: printed by Jouve et Cie (part 1), Winter, Heidelberg (part 2)), 1821-1929. 2 text parts (4to, bound in one volume) and an atlas (folio). With a photographical frontispiece portrait in the text volume and 133 lithographed plates, including 120 coloured by hand. Contemporary brown half morocco. 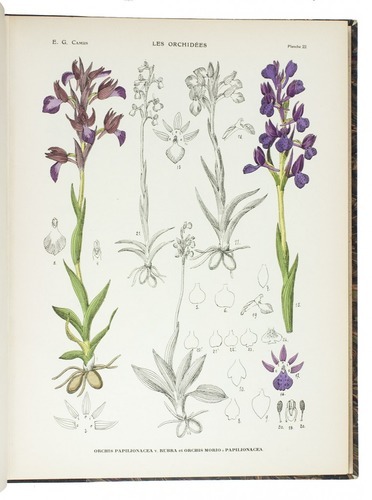 First and only edition of a well-illustrated and comprehensive study of the orchids of Europe and the Mediterranean, published posthumously by the daughter of Edmond Gustave Camus (1852-1915), a pharmacist and botanist fascinated by the intricate taxonomy of the family Orchidaceae. Aimée Antoinette Camus (1879-1965) worked together with her father on this project until his death in 1915. She would continue the research and finally published the present work, which is preceded by an obituary by Henri Lecomte and a bibliography of the elder Camus's his works. The present copy not only has the regular 110 of the 122 plates of the first part of the atlas coloured by hand, but also 10 of the 11 plates of the second part. A very good copy, well bound, with only the spines slightly discoloured. Nissen, BBI 316; Stafleu & Cowan 971.